Most Pontiac V-8s were originally fitted with cast-aluminum pistons, and they operated quietly and consistently. Forged-aluminum pistons were specified to improve the reliability and durability of Pontiac’s very high performance engines such as the Ram Air IV and Super Duty 421 and 455. The cast Pontiac piston is a durable design that offers reliable performance throughout the lifespan of a typical engine. Its wrist pin is biased toward the thrust side to lessen cylinder wall loading and promote quiet operation. Large valve pockets allow maximum piston-to-valve clearance. A dish was machined into the crown of some to reduce compression ratio in certain applications. Though suitable for everyday driving, cast pistons are susceptible to failure when exposed to very lean conditions, extreme heat, and/ or detonation over long periods of time. Pontiac sourced forged-aluminum pistons from Mickey Thompson for the early Super Duty engines while TRW provided the forgings for the R/A IV and SD-455. Forged-aluminum pistons are far more forgiving than cast units and the TRW pieces are quite durable. Using the R/A IV design as the basis, TRW began offering a wide array of stock-replacement forgings for most Pontiac engines in stock displacement and popular overbore sizes. Several of the high-volume offerings remain available under Federal-Mogul’s Speed Pro line. Auto manufacturers used cast-aluminum pistons in production engines for many years. They are cheap to produce, and they operate quietly and consistently throughout an engine’s lifetime when properly designed. The piston that Pontiac developed during the late 1960s was an excellent piece. TRW copied its design to produce high performance aftermarket forgings. Pontiac specified forged-aluminum pistons for its Super Duty and Ram Air IV engines. The SD-455 piston was a unique design specific to that application. It contains many features aimed at maximizing durability; among them is a single-trough valve pocket, which displaces just over 3 cc. 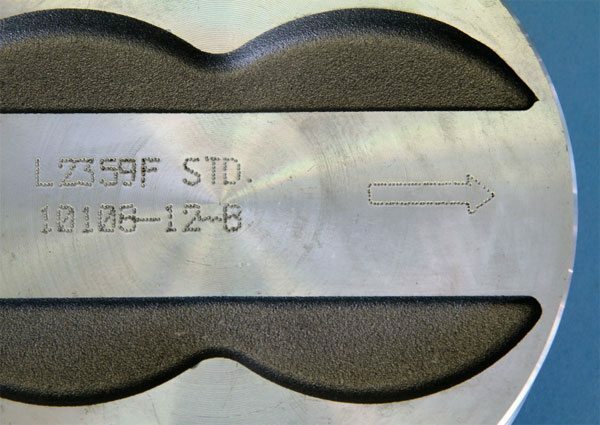 Federal-Mogul offered this piston (number L2423F) in various over sizes in its Speed Pro line, but was discontinued in February 2007. 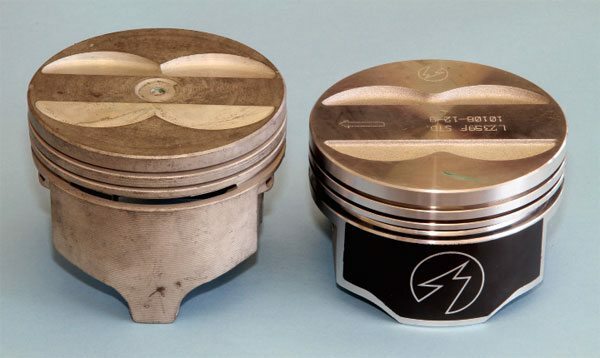 When compared to the modern Speed Pro piston (right), it’s easy to see how much influence Pontiac’s original cast piston (left) had on the design of the TRW original stock replacement forging. Federal- Mogul purchased TRW in 1992 and began producing the pistons in June 2001, incorporating some modern technology in the process. The most apparent changes are in the skirt area. Keith Black (KB) offers a number of off the- shelf forged pistons for Pontiac V-8s in its ICON line. Readily available from mail-order companies or Pontiac parts suppliers for about $400 and constructed of low-silicon 2618-alloy with thin ring packages, KB pistons are an excellent choice for any serious performance application. They are available with press-fit or floating wrist pins for stock-length or longer connecting rods, and with a variety of valve pocket volumes. Myriad stock-replacement cast pistons were produced throughout the years, and a variety is still available on the aftermarket at a very reasonable cost. A hypereutectic piston is made from a modern silicon-aluminum alloy that’s often used to cast pistons, and it’s generally considered a step better than aluminum. While pistons constructed of either material can certainly provide a long service life in a naturally aspirated engine, operating conditions must be ideal at all times or failure can result. With that, I am not comfortable using cast or hypereutectic pistons in any high-performance engine. I consider forged-aluminum pistons a must in any performance engine, especially if nitrous oxide or forced induction is planned or could be used in the future. Forgings are generally much more tolerant to high-combustion heat, momentary lean conditions, and/or detonation. While no piston should be expected to survive indefinitely if such conditions aren’t quickly corrected, there’s much less chance of failure with a quality forging when compared to a cast piston. Most Pontiac vendors can supply you with a set of high-quality forged pistons at a price ranging between $400 and $600. JE Pistons, Keith Black, Probe, and Speed Pro are just a few companies that produce off-the-shelf forging that fit the Pontiac V-8 without modifications. Options can range from a stock-replacement design to a lightweight forging better suited for high-RPM applications. 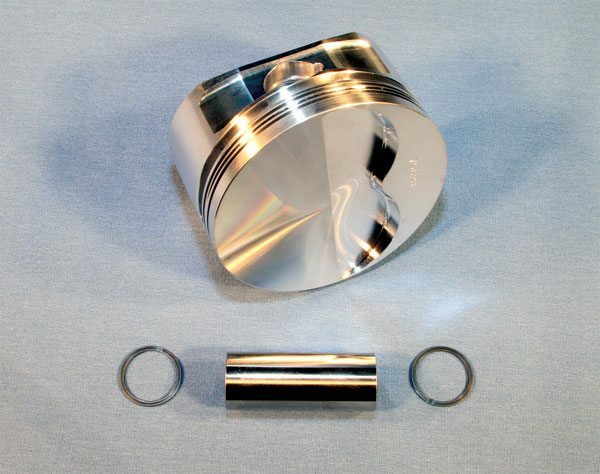 JE Pistons offers several high quality flat-top pistons for 400, 428, and 455 engines in its SRP line. Constructed of high-silicon aluminum alloy, its pistons are fully machined to a limited number of specific overbore sizes and feature a valve pocket displacing 5 cc. The wrist pin hole is bored to accept a .980-inch-diameter pin for use with stock-length Pontiac connecting rods for certain applications or .990-inchdiameter pin for stroker engines using 6.8-inch rods. The wrist pin hole is grooved to accept lock rings for floating pins. The ICON line by Keith Black contains a number of high-quality forged pistons for original 400 to 455 Pontiac blocks, and at least one large-bore aftermarket Pontiac block dimension. Available in myriad standard and overbore sizes, and in a flat-top design with a valve pocket displacement of 4 to 5 cc, or a dished crown ranging from 10 to 30 cc to reduce compression, ICON pistons are constructed of a low-silicon alloy aluminum for maximum endurance and reduced drag. 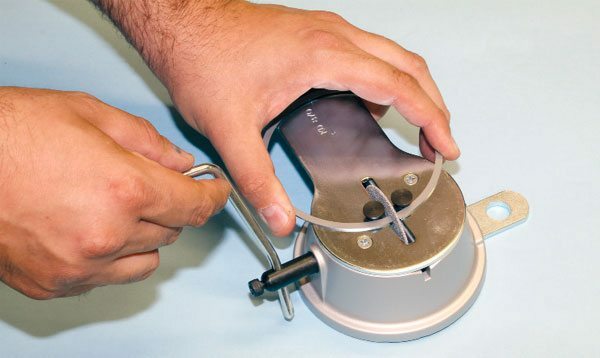 The wrist pin hole is machined for floating pins and accepts .980- or .990-inch pins depending upon the application. 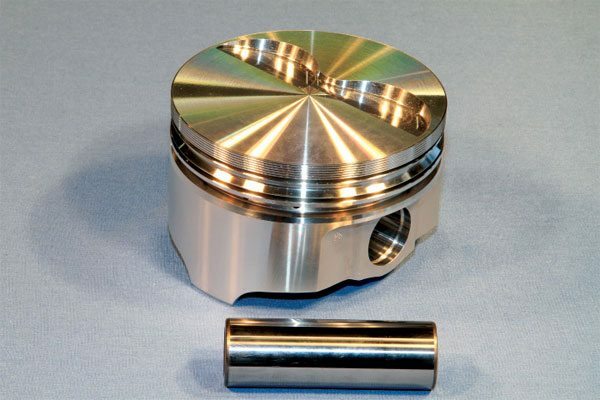 For those using an aftermarket block with a bore diameter of 4.35 inches, KB offers at least one off-the-shelf forged piston for 505-plus-ci engines in standard size, and in .005- and .010-inch over sizes. KB number-IC631 is designed for use with 6.8-inch connecting rods and features a compression height of 1.29 inches. The valve pocket measures just over 15 cc, which achieves a compression ratio of 10:1 when using 87-cc cylinder heads on a 505-ci Pontiac V-8. 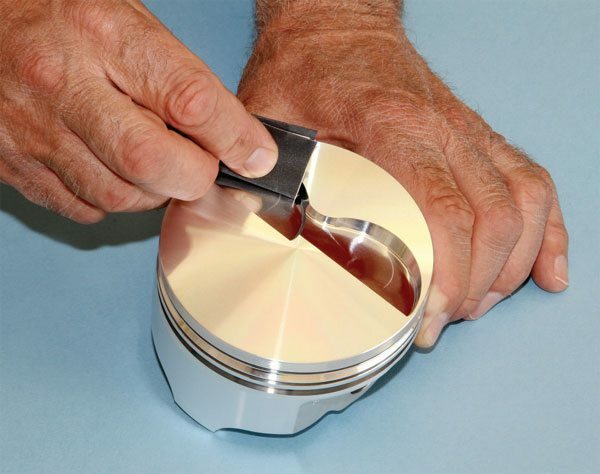 Machining a dish into the piston head is an accepted way to reduce an engine’s compression ratio. The piston being machined must have enough material in its head to accommodate that dish while maintaining optimal strength for the application, however. KB offers a limited number of forged pistons featuring a machined dish that measures between 10 and 16 cc, depending upon the application. The dish of this particular example measures 15 cc. 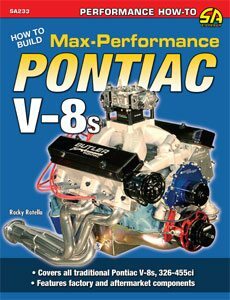 It is an excellent choice when building an engine intended to operate on pump gas that uses small-chamber cylinder heads. When Federal-Mogul purchased TRW, it incorporated TRW’s Power forged line of high-quality forged pistons into its own Speed Pro catalog. Though many low-volume Pontiac offerings have been discontinued, a number of stock replacement forgings, such as this +.030-inch 455 example (number L2359F030), are readily available in many popular original Pontiac sizes, and in over sizes common for rebuilds. Expect to spend about $400 for a complete set. 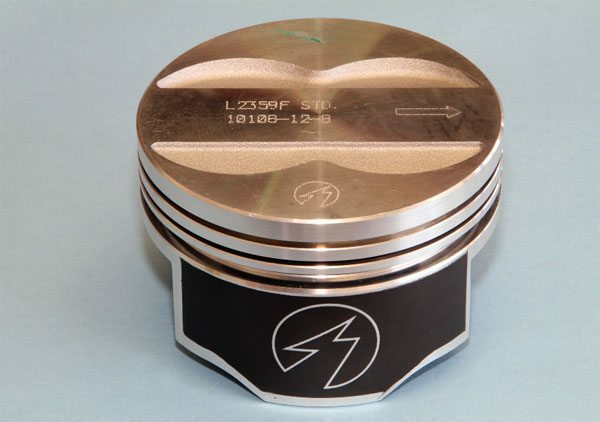 Federal-Mogul offers several high quality forged pistons in its Speed Pro Power forged line. Constructed of extruded aluminum alloy, an updated skirt design reduces drag and is moly coated to resist scuffing and reduce side clearance for quiet operation while the 5/64-inch top ring provides maximum reliability and cylinder seal. Considered a high-performance stock replacement for select 389 to 455 engines in limited stock and overbore sizes, the crown area is very thick for maximum durability, and can also be machined for custom applications. Because the valve pocket is positioned for valves in the stock location, some modification may be required when using certain aftermarket cylinder heads and/or larger-diameter valves. The wrist pin bore is offset as on a Pontiac original, and is machined for a press-fit .980-inch wrist pin only. If your rebuild uses a stock-stroke crankshaft and stock-length connecting rods, then stock-replacement forgings are an excellent choice. 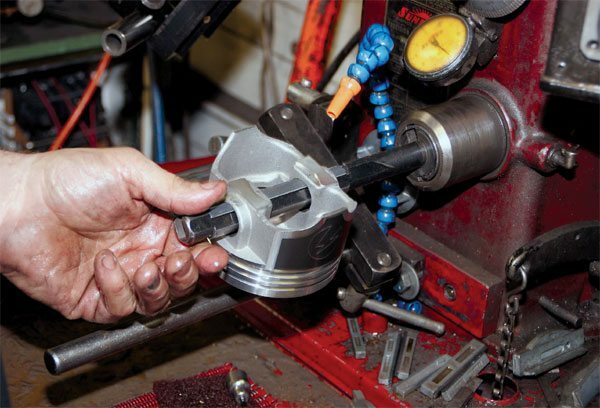 Custom pistons are sometimes required when using a long-stroke crankshaft, aftermarket connecting rods, specific overbore sizing, or for various other reasons. Diamond, Ross, and Venolia are a few companies that produce high-quality custom forgings. When designing a custom piston, the wrist pin bore, ring grooves, and valve pockets can be located in most any position on the piston. 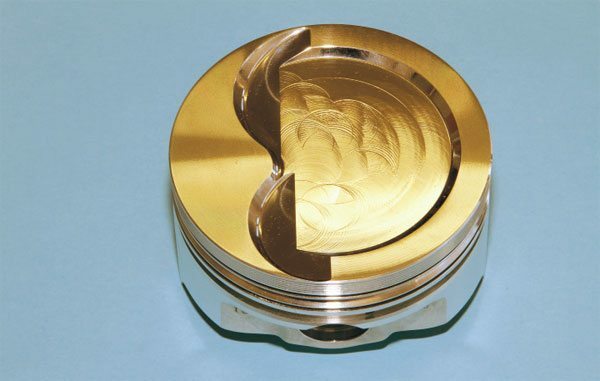 When the required dimensions of a piston for a particular engine vary beyond what’s commonly available in off-the-shelf sizes, companies such as Ross Racing Pistons specialize in producing high-quality forgings that feature custom dimensions. Ross can accommodate most requests, offering many unique options to provide you with the best piston possible. Total Seal is an industry leader in piston ring design and versatility. From barrel faced, ductile iron conventional rings with a moly-faced coating to high-end diamond lapped rings with gapless ends, it offers many common off-the-shelf sizes and produces myriad custom sets as well. Total Seal offers some of the best ring sets in the industry, especially for highly specialized applications where very high cylinder pressure or very low drag is required. Some Pontiac builders regularly stock specially designed custom pistons for their proprietary stroker kits. Special characteristics may be required if custom pistons are required for your particular Pontiac. Expect to spend more than $600 for a quality set. If you plan to tear your engine down regularly, you might consider ordering one or more extra pistons. Having spares can save you time and money. One custom piston feature that’s somewhat as popular with other makes, but not always popular for Pontiacs, is gas ports. Gas ports are a series of small holes that are precisely drilled into the head of the piston and through to the ring groove. A gas port allows a small amount of cylinder pressure to pass behind the top ring, pressurizing it and improving cylinder seal. It can be beneficial when using very narrow ring packs and/or high ring positions, which are commonly associated with very high RPM engines. If you plan for such operation with your Pontiac and will be using custom pistons, it may be a feature to consider. Piston rings are intended to keep cylinder pressure from entering the crankcase while maintaining a very light film of oil on the cylinder walls to lubricate the piston as it travels up and down. 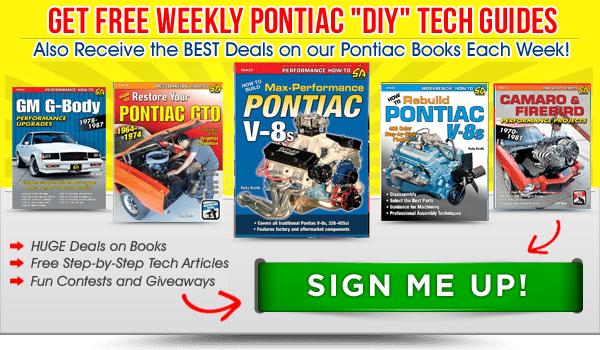 Most Pontiac pistons utilize a ring pack consisting of three separate piston rings. The top two are compression rings, which serve to keep cylinder pressure from entering the crankcase while scraping excess oil off the cylinder walls to reduce oil consumption. The bottom ring is designed to keep a majority of the engine oil that’s splashing about the crankcase (and onto the cylinder walls) below the compression rings, thoroughly lubricating the piston skirt in the process. 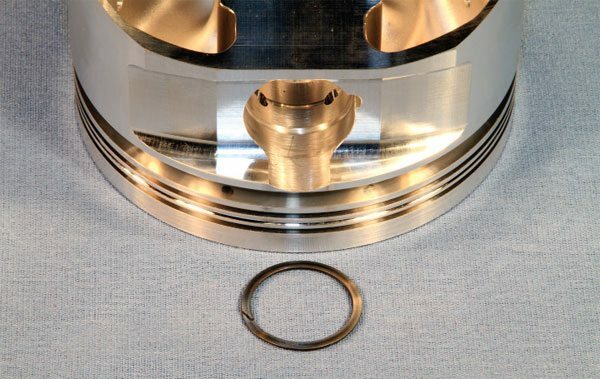 Generally speaking, improved piston ring seal equates to greater horsepower and torque. Modern technology has improved piston ring design. 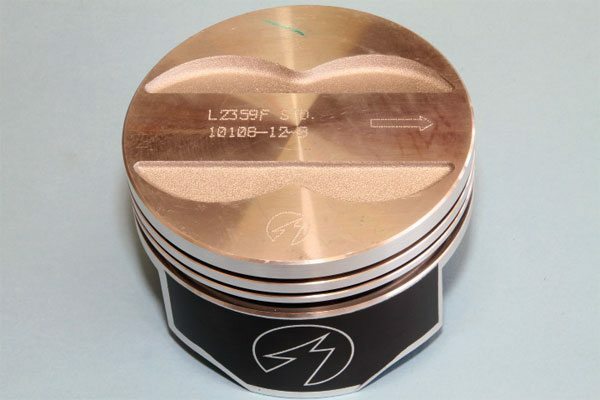 Available materials and cylinder-wall finishing processes have improved the performance and longevity of an otherwise typical piston ring set. Compression rings can be made much thinner, significantly reducing operational friction without compromising cylinder seal, and applying this technology to your Pontiac has benefit. Piston rings are rather delicate and proper installation is critical to operational consistency. Total Seal offers a number of tools that allow correct and easily installation. That includes a specific tool for compressing rings when installing assembled pistons into the block (left), installing rings on pistons (center), and a squaring tool (right) for test fitting rings in the block to measure end gap. Such tools are readily available from most mail-order suppliers and premium local auto parts stores. A specific amount of piston ring end gap is required to prevent the ring ends from butting against one another as the ring expands as the engine comes up to temperature. Most piston rings must be trimmed to achieve the recommended amount of end gap for a particular application. A small file locked in a vise is acceptable. The ring ends should be filed carefully and slowly in a pattern from the face toward the center to prevent chipping any face coatings. I prefer a hand-operated end gap grinder such as this from Federal- Mogul (number MT-135). It grinds easily and consistently and has a replaceable wheel. No matter what method you use to adjust the end gap, be sure the ring ends are parallel to prevent any operational issue. When selecting a piston ring package, you will find that most aftermarket forged pistons require 1/16-inch-thick compression rings, and a 3/16-inch-thick oil-control ring. Most conventional ring sets are purposely left a bit tight and must be file-fit by hand to achieve the proper amount of end gap for a particular combination. Some are even designed to run gapless. Be sure the ring type that you select is compatible with the cylinder wall finish left after honing. I have used various Speed Pro ductile iron rings with moly-face coatings with excellent results. 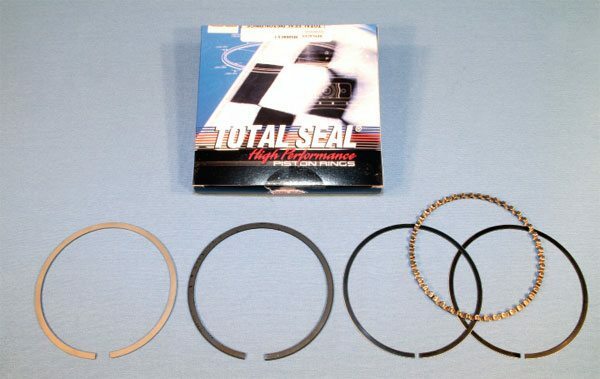 Total Seal offers a variety of readymade piston ring kits for many popular off–the-shelf Pontiac pistons, and it can quickly produce custom rings in any width or thickness for highly specialized applications, such as those running nitrous or forced induction. I highly recommend discussing your piston ring options with the piston manufacturer and/or your Pontiac builder to ensure you’re making the best selection for your particular application. A specific amount of compression ring end gap is required during assembly. It allows the ring to expand controllably in the cylinder as the engine reaches normal operating temperature. Too much end gap can allow an excessive amount of cylinder pressure to pass into the crankcase a performance-compromising condition referred to as “blow-by.” An end gap that’s too tight can cause the ring to bind with the cylinder bore, scoring the cylinder wall, and breaking the piston ring and/or ring lands. In years past, it wasn’t uncommon to find end gap specifications wider for the top ring than the second. 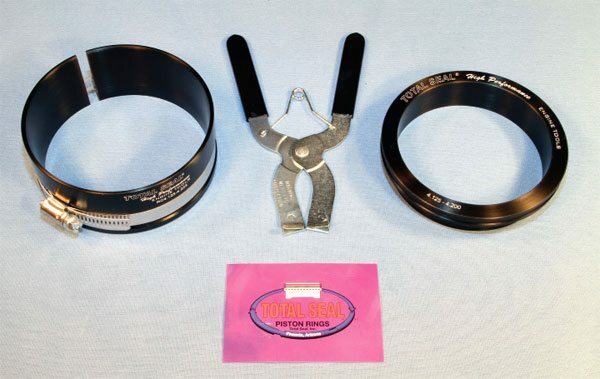 Generally speaking, modern ring packs are designed to operate with about .004 inch of top compression ring end gap for each inch of bore diameter, and .005 inch of second compression ring end gap for that same measurement. The oil-control ring gap simply needs to be more than .015 inch in nearly all applications. There are many excellent piston options. 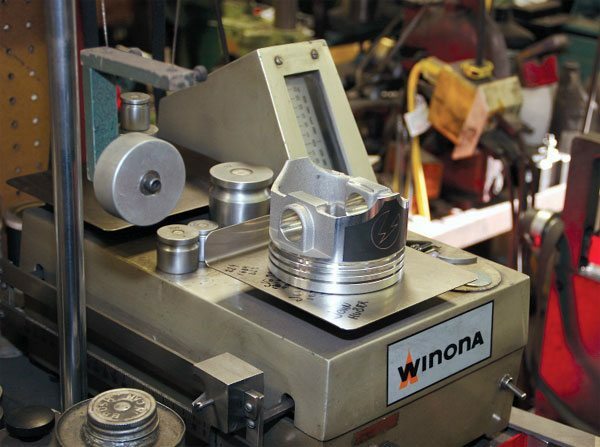 Once you’ve made your selection, it’s wise to closely inspect each new piston before sending the entire set to your machinist for proper weight balancing along with the rest of the rotating assembly. For me, that process typically includes taking very fine sandpaper (1,000 grit or more) that’s been wetted to the valve pocket area in the head of the piston. A red scouring pad also suffices. Assuming that sufficient cylinder wall clearance was present at all times and there were no lubrication issues or major failures, you will likely find the pistons in excellent condition during routine tear downs. If you hope to reuse the pistons, the first step should always include measuring the dimensions with a micrometer. If any of them is not within the manufacturer’s stated tolerances, it’s best to replace the entire set. When pistons are machined, the process may leave some sharp edges behind. Though rare, any sharp edges created when cutting the valve pockets can create hotspots that induce detonation in certain operating conditions where fuel octane is marginal. To prevent any chance of detonation related to it, I routinely remove any sharp edges prior to installation with 1,000-grit sandpaper that’s been wetted. Little more than a gentle polish is all that’s required. Before placing a new piston set in service, plan to have your machinist verify the diameter of the wrist pin bore of the entire set. The intent is to ensure that it’s within the suggested tolerance with the wrist pins being used. Don’t be alarmed if some minor honing is required, especially if floating pins are used. Since the pistons are part of the rotating assembly, they too must be balance matched along with all other components for optimal engine reliability and performance. Most manufacturers leave a “pad” of material located just below the wrist pin bore. Material is removed from this area until all the pistons of a particular set weigh the same. If your pistons and block measure correctly, then there shouldn’t be any issue with reusing the pistons once properly cleaned. Any carbon built up on the head can be removed chemically. It’s best to ask your piston manufacturer for its recommendations on what to use. It isn’t unusual to find some very light scratches on the piston skirts during the inspection process, particularly on the thrust side. You might be tempted to reuse pistons that are slightly loose, but in otherwise good condition. This, however, can lead to excessive piston skirt noise (piston slap), wrist pin noise, and/or oil consumption. In the past, knurling was a popular way to reuse slightly-worn pistons. The knurling process gathers material around the skirt area and expands the piston’s dimension to compensate for the wear. I feel this practice has no place in a modern performance engine. Engine component coatings are popular in today’s performance world, and pistons are likely the most commonly coated engine component. 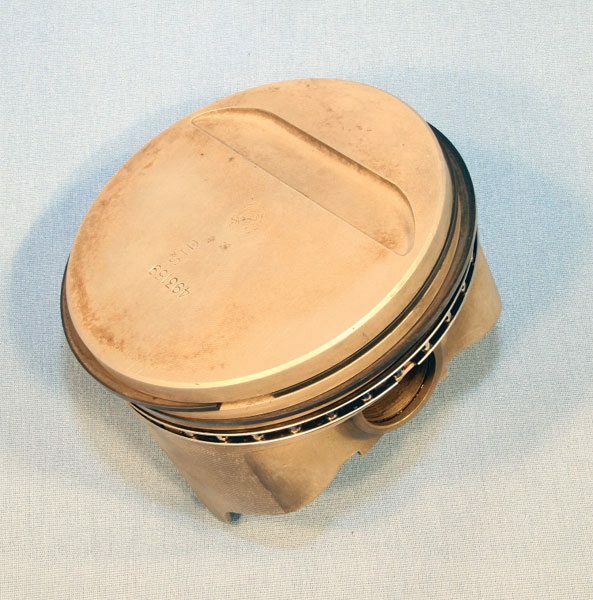 Some coatings, such as a ceramic applied to the head of the piston, act as a thermal barrier that rejects heat. 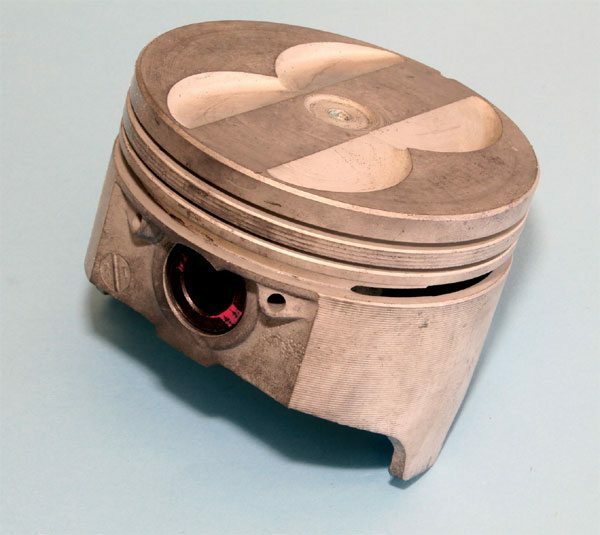 It can increase the amount of combustion heat a particular piston can withstand, while preventing the heat of the combustion process from escaping, potentially improving power output. Other coatings, such as a dry film moly-based lubricant applied to the skirt, serve to reduce friction and wall clearance while improving acceleration without skirt damage. Many independent tests indicate that engine coatings improve performance in certain applications. 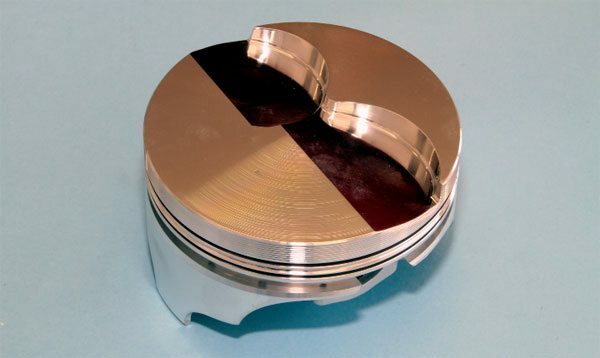 Ceramic coatings applied to piston heads reject heat, while dry film coatings applied to the piston skirts reduce rotational friction and improve component longevity. Federal-Mogul coats the skirt of many pistons in its Speed Pro line with moly-graphite, which acts as a wear lubricant to protect scuffing on initial startup and ensure quiet operation. Many companies specialize in such coatings, and I suggest asking your engine builder to determine if any coating is recommended for your particular build. Lock rings are used to retain floating wrist pins, and two are generally used on each end. The rings are coiled much like a key ring, and proper installation consists of gently stretching the lock ring to separate the coils and then placing the lock ring in the corresponding groove that is machined into the piston and gradually walking it around until it snaps into place. New lock rings should be used during each teardown. 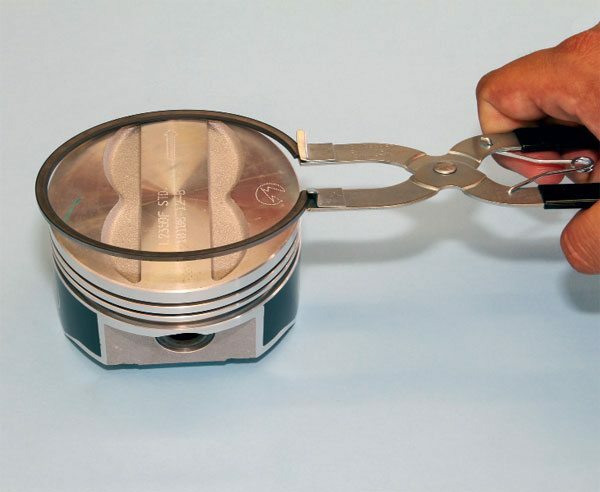 Hobbyists have found several ways to install piston rings. Some cause permanent distortion or a loss of tension, however, which greatly affects its sealing ability. After end gap has been measured and/or adjusted accordingly, a compression ring is properly installed onto a piston by spreading it with a special tool until it just fits over the head and then is carefully slipped into place. Remember a top ring is often gapped differently than a second, and some ring kits require special orientation, so plan accordingly. If a piston’s wrist pin bore is offset, there should be an arrow or notch indicating which end should face forward during installation. The valve pocket of some pistons is shaped in a way that the intake valve pocket is larger and/or deeper than the exhaust, and the pistons must be oriented accordingly. Pay particular attention to head design of the pistons used during your build to be sure they are installed correctly. Consult the piston manufacturer if you have any questions. Certain Pontiac pistons, such as the Speed Pro units from Federal-Mogul, come with a light moly-based coating that’s factory applied to the skirts. It reduces friction and provides quieter operation when compared to non-coated examples.